It is very common that we talk of the importance of protein, carbohydrates and fats in our diet, but one of the most under rated and misunderstood macronutrients is water. A while a go I read an amazing book called ‘Your Bodies Many Cries for Water’ by Dr Batmanhelidj. Since this I have had a great deal of respect for what an important part of our diet water is, and with this has come my interest in electrolytes. Anyone who has been reading across my blogs for some while will know that I am a user of electrolytes, to help maintain and optimise my hydration levels. I think that the use of electrolytes is an often under rated aspect of nutrition. Although I do not supplement every drink with these magical substances but I use them in a range of situations. First of all though maybe we should consider what electrolytes actually are, well they are essentially provide a set of minerals salts that help to maintain hydration, prevent cramps, enhance your mental focus and hep to sustain energy/focus. I find that with the large amount of travel that I do, that it can be easy for me to become dehydrated. I have used them to great effect on the dreaded long haul flights which is a very dehydrating environment. A few years back I came across a company called Elete Electrolytes after seeming to hear about them on a wide range of podcasts and in articles. I decided to give these a go and these have been by far some of the best electrolytes that I have used. The electrolytes are a solution and come in a range of size of bottles, my favourite has always been the 25ml pocket bottle. This is a really handy item as it is easy to transport, I tend to have a couple about at any one time. This small dropper bottle packs some power with the 25ml of solution working with 10 litres of electrolyte charged water. The container is robust, designed to avoid spillage and is refillable. This means you can save on cost per litre by buying one of the larger 120ml, 240ml or 480ml, and refilling the pocket bottle. 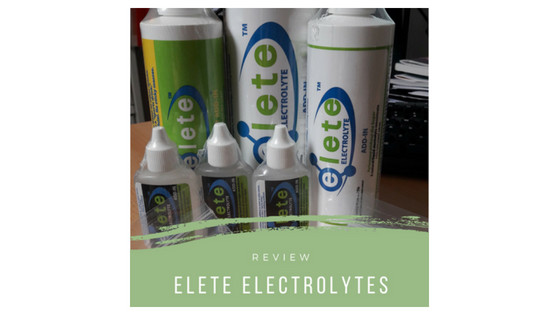 I have used Elete electrolytes across a range of situations to see how it worked and if I felt it made any impact on my hydration levels. Having been using them for over 3 years now I can honestly say they make such a difference is a large range of situations. I have used them throughout the day, and especially in and around sport. They have definitely made a difference to not only my hydration levels but also my energy levels. One of the situations that I have found Elete electrolytes to be most useful in is hot conditions. I tend to dehydrate quickly when overseas in a hot environment. It is also the problem that retaining the water can sometimes be as much as an issue when in these conditions. Having the electrolytes with me have greatly reduced the dehydration headaches and tiredness allowing me to make the most of the heat and the sun. It has even helped on more than one occasion with what was expected to be a killer hangover. It is when the product is used playing sport or in the gym when it comes into its own, this product is really a wonder hydrater which ultimately results in better performance. I would strongly recommend that you give it a go at a few quid for a pocket bottle it is worth a try and I can promise you will be a convert to the power of Eletewater!